By the end of the 1920s the federal highway system changed names of early routes to a system of standardized numbering. In Pennsylvania and across other states, the Lincoln Highway was renamed U.S. Route 30. 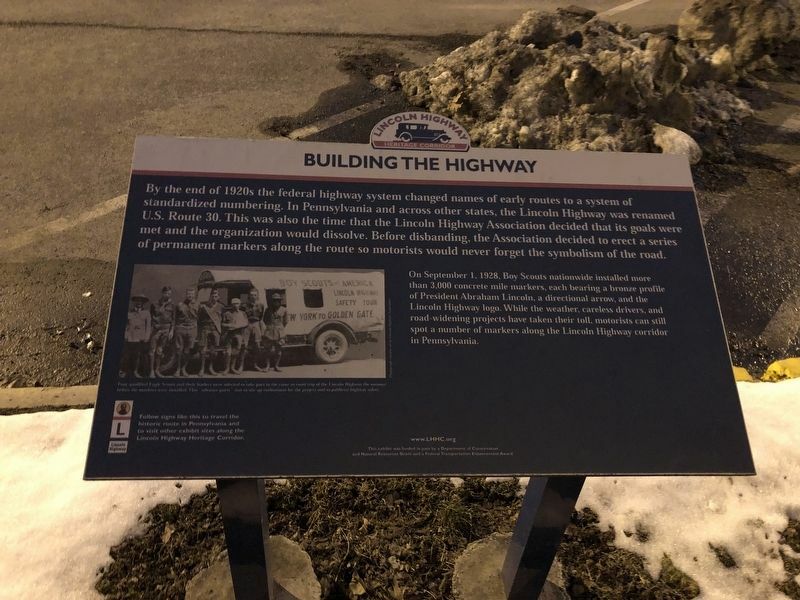 This was also the time that the Lincoln Highway Association decided that its goals were met and the organization would dissolve. Before disbanding, the Association decided to erect a series of permanent markers along the route so motorists would never forget the symbolism of the road. On September 1, 1928, Boy Scouts nationwide installed more than 3,000 concrete mile markers, each bearing a bronze profile of President Abraham Lincoln, a directional arrow, and the Lincoln Highway logo. While the weather, careless drivers, and road-widening projects have taken their toll, motorists can still spot a number of markers along the Lincoln Highway corridor in Pennsylvania. Location. 39° 51.817′ N, 77° 3.376′ W. Marker is in New Oxford, Pennsylvania, in Adams County. Marker is at the intersection of Center Square (U.S. 30) and Lincoln Way West (U.S. 30), on the right when traveling east on Center Square. Touch for map. Marker is at or near this postal address: 19 Center Square, New Oxford PA 17350, United States of America. Touch for directions. Other nearby markers. At least 8 other markers are within walking distance of this marker. World War II Veterans of New Oxford (within shouting distance of this marker); Theo. Pfeiffer (within shouting distance of this marker); New Oxford Veterans Memorial (within shouting distance of this marker); Kuhn Tavern (within shouting distance of this marker); Road Versus Rail (approx. 0.2 miles away); Gettysburg Campaign (approx. 0.2 miles away); Fill 'Er Up (approx. 0.4 miles away); Conewago Chapel (approx. 0.7 miles away). Touch for a list and map of all markers in New Oxford. More. Search the internet for Building the Highway. Credits. This page was last revised on February 26, 2019. This page originally submitted on February 24, 2019, by Devry Becker Jones of Washington, District of Columbia. This page has been viewed 45 times since then. Photo 1. submitted on February 24, 2019, by Devry Becker Jones of Washington, District of Columbia. • Andrew Ruppenstein was the editor who published this page.